Zenit-4. 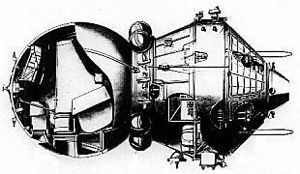 Later improved version Zenit-4 commonly had a Nauka module mounted on the forward end of the sphere. Russian military surveillance satellite. Zenit-4 was the second Soviet photo-reconnaissance satellite, providing high-resolution imagery to complement the area coverage of the Zenit-2. Reconnaissance, photo (high resolution, film return type) satellite built by TsSKB for GRU, Russia. Launched 1963 - 1970. Used Zenit bus. AKA: 11F69;4K;Vostok 4. Status: Operational 1963. First Launch: 1963-11-16. Last Launch: 1970-08-07. Number: 76 . Gross mass: 6,300 kg (13,800 lb). The Zenit-4 draft project was completed in 1964. The high resolution system used a 3 m focal length camera. Development was done by Kozlov at OKB-1 Filial 3. Chertok and Tsybin were in charge of the flight tests. Zenit-4 was equipped with the Ftor-4 camera and was accepted into service in 1965. Typical orbital profile: inclination 65 degrees with altitude of 202-320 km; inclination 51.8 degrees with altitude of 199-286 km; inclination 72.8 degrees with altitude of 204-331 km; inclination 81.3 degrees with altitude of 201-368 km. Designed duration: 8 days. Transmission frequencies observed in West: 19.995 PDM; sometimes; 19.990 PDM. Family: Military surveillance sat, Surveillance, Surveillance orbit. Country: Russia. Engines: TDU-1. Spacecraft: Voskhod. Launch Vehicles: R-7, Voskhod 11A57. Launch Sites: Baikonur, Baikonur LC1, Plesetsk, Baikonur LC31, Plesetsk LC41/1, Plesetsk LC43/4. Agency: Kozlov bureau. Bibliography: 102, 110, 2, 279, 376, 445, 474, 6, 7056, 13383. 1962 January 18 - . LV Family: R-7. Launch Vehicle: Voskhod 11A57. Korolev requests new Vostoks - . Nation: Russia. Related Persons: Korolev. Program: Vostok. Spacecraft: Vostok, Vostok-Zh, Zenit-4. Korolev has issued a letter requested eight new Vostok 3A spacecraft to be built in 1962-1963. He recommends that they should be finished as the 1100 to 1300 kg heavier 'Vostok-2', to be boosted by the 11A57 rocket, developed originally for the Zenit-4 spy satellite. These Vostok-2's will be used for docking experiments, to form EO Experimental Orbital stations, and to develop spacecraft systems for flight to the moon. The VVS fully supports these plans. One of the docking spacecraft will be piloted, the other unpiloted. 1963 November 16 - . 10:34 GMT - . Launch Site: Baikonur. Launch Complex: Baikonur LC1. LV Family: R-7. Launch Vehicle: Voskhod 11A57. Cosmos 22 - . Payload: Zenit-4 no. 1. Mass: 6,300 kg (13,800 lb). Nation: Russia. Agency: Korolev bureau. Class: Surveillance. Type: Military surveillance satellite. Spacecraft Bus: Vostok. Spacecraft: Zenit-4. Duration: 6.00 days. Decay Date: 1963-11-22 . USAF Sat Cat: 689 . COSPAR: 1963-045A. Apogee: 376 km (233 mi). Perigee: 193 km (119 mi). Inclination: 64.90 deg. Period: 90.20 min. High resolution photo reconnaissance satellite; returned film capsule. 1964 May 18 - . 09:50 GMT - . Launch Site: Baikonur. Launch Complex: Baikonur LC1. LV Family: R-7. Launch Vehicle: Voskhod 11A57. Cosmos 30 - . Mass: 6,300 kg (13,800 lb). Nation: Russia. Agency: Korolev bureau. Class: Surveillance. Type: Military surveillance satellite. Spacecraft Bus: Vostok. Spacecraft: Zenit-4. Duration: 8.00 days. Decay Date: 1964-05-26 . USAF Sat Cat: 797 . COSPAR: 1964-023A. Apogee: 366 km (227 mi). Perigee: 206 km (128 mi). Inclination: 64.90 deg. Period: 90.30 min. High resolution photo reconnaissance satellite; returned film capsule. 1964 July 1 - . 11:16 GMT - . Launch Site: Baikonur. Launch Complex: Baikonur LC1. LV Family: R-7. Launch Vehicle: Voskhod 11A57. Cosmos 34 - . Mass: 6,300 kg (13,800 lb). Nation: Russia. Agency: Korolev bureau. Class: Surveillance. Type: Military surveillance satellite. Spacecraft Bus: Vostok. Spacecraft: Zenit-4. Duration: 8.00 days. Decay Date: 1964-07-09 . USAF Sat Cat: 822 . COSPAR: 1964-034A. Apogee: 342 km (212 mi). Perigee: 201 km (124 mi). Inclination: 64.90 deg. Period: 89.90 min. High resolution photo reconnaissance satellite; returned film capsule. 1965 March 7 - . 09:07 GMT - . Launch Site: Baikonur. Launch Complex: Baikonur LC31. LV Family: R-7. Launch Vehicle: Voskhod 11A57. Cosmos 59 - . Mass: 6,300 kg (13,800 lb). Nation: Russia. Agency: MOM. Class: Surveillance. Type: Military surveillance satellite. Spacecraft Bus: Vostok. Spacecraft: Zenit-4. Duration: 8.00 days. Decay Date: 1965-03-15 . USAF Sat Cat: 1191 . COSPAR: 1965-015A. Apogee: 321 km (199 mi). Perigee: 205 km (127 mi). Inclination: 64.90 deg. Period: 89.80 min. 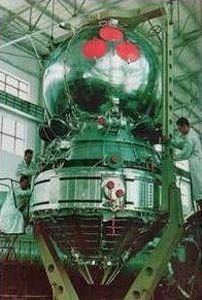 High resolution photo reconnaissance satellite; returned film capsule fitted with airlock mating ring planned for Voskhod-2 spacecraft..
1965 April 17 - . 09:50 GMT - . Launch Site: Baikonur. Launch Complex: Baikonur LC31. LV Family: R-7. Launch Vehicle: Voskhod 11A57. Cosmos 65 - . Mass: 6,300 kg (13,800 lb). Nation: Russia. Agency: MOM. Class: Surveillance. Type: Military surveillance satellite. Spacecraft Bus: Vostok. Spacecraft: Zenit-4. Duration: 8.00 days. Decay Date: 1965-04-25 . USAF Sat Cat: 1320 . COSPAR: 1965-029A. Apogee: 315 km (195 mi). Perigee: 207 km (128 mi). Inclination: 65.00 deg. Period: 89.70 min. High resolution photo reconnaissance satellite; returned film capsule; also carried weather experiments..
1965 May 25 - . 10:48 GMT - . Launch Site: Baikonur. Launch Complex: Baikonur LC31. LV Family: R-7. Launch Vehicle: Voskhod 11A57. Cosmos 67 - . Payload: Zenit-4. Mass: 6,300 kg (13,800 lb). Nation: Russia. Agency: MOM. Class: Surveillance. Type: Military surveillance satellite. Spacecraft Bus: Vostok. Spacecraft: Zenit-4. Duration: 8.00 days. Decay Date: 1965-06-02 . USAF Sat Cat: 1382 . COSPAR: 1965-040A. Apogee: 351 km (218 mi). Perigee: 203 km (126 mi). Inclination: 51.80 deg. Period: 90.10 min. High resolution photo reconnaissance satellite; returned film capsule. 1965 June 25 - . 09:50 GMT - . Launch Site: Baikonur. Launch Complex: Baikonur LC1. LV Family: R-7. Launch Vehicle: Voskhod 11A57. Cosmos 69 - . Mass: 6,300 kg (13,800 lb). Nation: Russia. Agency: MOM. Class: Surveillance. Type: Military surveillance satellite. Spacecraft Bus: Vostok. Spacecraft: Zenit-4. Duration: 8.00 days. Decay Date: 1965-07-03 . USAF Sat Cat: 1421 . COSPAR: 1965-049A. Apogee: 310 km (190 mi). Perigee: 206 km (128 mi). Inclination: 64.90 deg. Period: 89.70 min. High resolution photo reconnaissance satellite; returned film capsule. 1965 August 3 - . 11:02 GMT - . Launch Site: Baikonur. Launch Complex: Baikonur LC31. LV Family: R-7. Launch Vehicle: Voskhod 11A57. Cosmos 77 - . Payload: Zenit-4. Mass: 6,300 kg (13,800 lb). Nation: Russia. Agency: MOM. Class: Surveillance. Type: Military surveillance satellite. Spacecraft Bus: Vostok. Spacecraft: Zenit-4. Duration: 8.00 days. Decay Date: 1965-08-11 . USAF Sat Cat: 1469 . COSPAR: 1965-061A. Apogee: 281 km (174 mi). Perigee: 200 km (120 mi). Inclination: 51.80 deg. Period: 89.30 min. High resolution photo reconnaissance satellite; returned film capsule. 1965 August 25 - . 10:19 GMT - . Launch Site: Baikonur. Launch Complex: Baikonur LC1. LV Family: R-7. Launch Vehicle: Voskhod 11A57. Cosmos 79 - . Mass: 6,300 kg (13,800 lb). Nation: Russia. Agency: MOM. Class: Surveillance. Type: Military surveillance satellite. Spacecraft Bus: Vostok. Spacecraft: Zenit-4. Duration: 8.00 days. Decay Date: 1965-09-02 . USAF Sat Cat: 1523 . COSPAR: 1965-069A. Apogee: 338 km (210 mi). Perigee: 206 km (128 mi). Inclination: 64.90 deg. Period: 89.90 min. High resolution photo reconnaissance satellite; returned film capsule. 1965 September 9 - . 09:36 GMT - . Launch Site: Baikonur. Launch Complex: Baikonur LC31. LV Family: R-7. Launch Vehicle: Voskhod 11A57. Cosmos 85 - . Mass: 6,300 kg (13,800 lb). Nation: Russia. Agency: MOM. Class: Surveillance. Type: Military surveillance satellite. Spacecraft Bus: Vostok. Spacecraft: Zenit-4. Duration: 8.00 days. Decay Date: 1965-09-17 . USAF Sat Cat: 1578 . COSPAR: 1965-071A. Apogee: 291 km (180 mi). Perigee: 202 km (125 mi). Inclination: 64.90 deg. Period: 89.50 min. High resolution photo reconnaissance satellite; returned film capsule. 1965 September 23 - . 09:07 GMT - . Launch Site: Baikonur. Launch Complex: Baikonur LC31. LV Family: R-7. Launch Vehicle: Voskhod 11A57. Cosmos 91 - . Mass: 6,300 kg (13,800 lb). Nation: Russia. Agency: MOM. Class: Surveillance. Type: Military surveillance satellite. Spacecraft Bus: Vostok. Spacecraft: Zenit-4. Duration: 8.00 days. Decay Date: 1965-10-01 . USAF Sat Cat: 1603 . COSPAR: 1965-075A. Apogee: 324 km (201 mi). Perigee: 203 km (126 mi). Inclination: 65.00 deg. Period: 89.80 min. High resolution photo reconnaissance satellite; returned film capsule. 1965 October 16 - . 08:09 GMT - . Launch Site: Baikonur. Launch Complex: Baikonur LC31. LV Family: R-7. Launch Vehicle: Voskhod 11A57. Cosmos 92 - . Payload: Bion precursor. Mass: 6,300 kg (13,800 lb). Nation: Russia. Agency: MOM. Class: Surveillance. Type: Military surveillance satellite. Spacecraft Bus: Vostok. Spacecraft: Zenit-4. Duration: 8.00 days. Decay Date: 1965-10-24 . USAF Sat Cat: 1626 . COSPAR: 1965-083A. Apogee: 331 km (205 mi). Perigee: 204 km (126 mi). Inclination: 64.90 deg. Period: 89.90 min. High resolution photo reconnaissance satellite; returned film capsule; also carried weather and biological experiments..
1965 October 28 - . 08:24 GMT - . Launch Site: Baikonur. Launch Complex: Baikonur LC31. LV Family: R-7. Launch Vehicle: Voskhod 11A57. Cosmos 94 - . Payload: Bion precursor. Mass: 6,300 kg (13,800 lb). Nation: Russia. Agency: MOM. Class: Surveillance. Type: Military surveillance satellite. Spacecraft Bus: Vostok. Spacecraft: Zenit-4. Duration: 8.00 days. Decay Date: 1965-11-05 . USAF Sat Cat: 1636 . COSPAR: 1965-085A. Apogee: 271 km (168 mi). Perigee: 205 km (127 mi). Inclination: 65.00 deg. Period: 89.20 min. High resolution photo reconnaissance satellite; returned film capsule; also carried biological experiments..
1966 February 19 - . 08:52 GMT - . Launch Site: Baikonur. Launch Complex: Baikonur LC31. LV Family: R-7. Launch Vehicle: Voskhod 11A57. Cosmos 109 - . Payload: Bion precursor. Mass: 6,300 kg (13,800 lb). Nation: Russia. Agency: MOM. Class: Surveillance. Type: Military surveillance satellite. Spacecraft Bus: Vostok. Spacecraft: Zenit-4. Duration: 8.00 days. Decay Date: 1966-02-27 . USAF Sat Cat: 2019 . COSPAR: 1966-014A. Apogee: 288 km (178 mi). Perigee: 204 km (126 mi). Inclination: 64.90 deg. Period: 89.40 min. High resolution photo reconnaissance satellite; returned film capsule; also carried biological experiments..
1966 March 21 - . 09:36 GMT - . Launch Site: Baikonur. Launch Complex: Baikonur LC31. LV Family: R-7. Launch Vehicle: Voskhod 11A57. Cosmos 113 - . Mass: 6,300 kg (13,800 lb). Nation: Russia. Agency: MOM. Class: Surveillance. Type: Military surveillance satellite. Spacecraft Bus: Vostok. Spacecraft: Zenit-4. Duration: 8.00 days. Decay Date: 1966-03-29 . USAF Sat Cat: 2114 . COSPAR: 1966-023A. Apogee: 314 km (195 mi). Perigee: 202 km (125 mi). Inclination: 64.90 deg. Period: 89.60 min. High resolution photo reconnaissance satellite; returned film capsule. 1966 April 6 - . 11:40 GMT - . Launch Site: Plesetsk. Launch Complex: Plesetsk LC41/1. LV Family: R-7. Launch Vehicle: Voskhod 11A57. Cosmos 114 - . Mass: 6,300 kg (13,800 lb). Nation: Russia. Agency: MOM. Class: Surveillance. Type: Military surveillance satellite. Spacecraft Bus: Vostok. Spacecraft: Zenit-4. Duration: 8.00 days. Decay Date: 1966-04-14 . USAF Sat Cat: 2133 . COSPAR: 1966-028A. Apogee: 337 km (209 mi). Perigee: 202 km (125 mi). Inclination: 72.80 deg. Period: 89.80 min. High resolution photo reconnaissance satellite; returned film capsule. 1966 May 17 - . Launch Site: Plesetsk. Launch Complex: Plesetsk LC41/1. LV Family: R-7. Launch Vehicle: Voskhod 11A57. FAILURE: Failure. Failed Stage: U.
Zenit-4 - . Mass: 6,300 kg (13,800 lb). Nation: Russia. Agency: RVSN. Spacecraft Bus: Vostok. Spacecraft: Zenit-4. High resolution photo reconnaissance mission..
1966 June 17 - . 11:00 GMT - . Launch Site: Plesetsk. Launch Complex: Plesetsk LC41/1. LV Family: R-7. Launch Vehicle: Voskhod 11A57. Cosmos 121 - . Mass: 6,300 kg (13,800 lb). Nation: Russia. Agency: MOM. Class: Surveillance. Type: Military surveillance satellite. Spacecraft Bus: Vostok. Spacecraft: Zenit-4. Duration: 8.00 days. Decay Date: 1966-06-25 . USAF Sat Cat: 2210 . COSPAR: 1966-054A. Apogee: 327 km (203 mi). Perigee: 205 km (127 mi). Inclination: 72.80 deg. Period: 89.80 min. High resolution photo reconnaissance satellite; returned film capsule. 1966 July 28 - . 10:48 GMT - . Launch Site: Baikonur. Launch Complex: Baikonur LC31. LV Family: R-7. Launch Vehicle: Voskhod 11A57. Cosmos 126 - . Payload: Zenit-4. Mass: 6,300 kg (13,800 lb). Nation: Russia. Agency: MOM. Class: Surveillance. Type: Military surveillance satellite. Spacecraft Bus: Vostok. Spacecraft: Zenit-4. Duration: 9.00 days. Decay Date: 1966-08-06 . USAF Sat Cat: 2368 . COSPAR: 1966-068A. Apogee: 343 km (213 mi). Perigee: 209 km (129 mi). Inclination: 51.80 deg. Period: 90.10 min. High resolution photo reconnaissance satellite; returned film capsule. 1966 August 8 - . 11:16 GMT - . Launch Site: Baikonur. Launch Complex: Baikonur LC31. LV Family: R-7. Launch Vehicle: Voskhod 11A57. Cosmos 127 - . Payload: Zenit-4. Mass: 6,300 kg (13,800 lb). Nation: Russia. Agency: MOM. Class: Surveillance. Type: Military surveillance satellite. Spacecraft Bus: Vostok. Spacecraft: Zenit-4. Duration: 8.00 days. Decay Date: 1966-08-16 . USAF Sat Cat: 2391 . COSPAR: 1966-071A. Apogee: 263 km (163 mi). Perigee: 201 km (124 mi). Inclination: 51.80 deg. Period: 89.10 min. High resolution photo reconnaissance satellite; returned film capsule. 1966 August 27 - . 09:50 GMT - . Launch Site: Baikonur. Launch Complex: Baikonur LC1. Launch Pad: LC1?. LV Family: R-7. Launch Vehicle: Voskhod 11A57. Cosmos 128 - . Mass: 6,300 kg (13,800 lb). Nation: Russia. Agency: MOM. Class: Surveillance. Type: Military surveillance satellite. Spacecraft Bus: Vostok. Spacecraft: Zenit-4. Duration: 8.00 days. Decay Date: 1966-09-04 . USAF Sat Cat: 2409 . COSPAR: 1966-079A. Apogee: 343 km (213 mi). Perigee: 207 km (128 mi). Inclination: 64.90 deg. Period: 90.00 min. High resolution photo reconnaissance satellite; returned film capsule. 1966 October 20 - . 08:52 GMT - . Launch Site: Baikonur. Launch Complex: Baikonur LC31. LV Family: R-7. Launch Vehicle: Voskhod 11A57. Cosmos 130 - . Mass: 6,300 kg (13,800 lb). Nation: Russia. Agency: MOM. Class: Surveillance. Type: Military surveillance satellite. Spacecraft Bus: Vostok. Spacecraft: Zenit-4. Duration: 8.00 days. Decay Date: 1966-10-28 . USAF Sat Cat: 2502 . COSPAR: 1966-093A. Apogee: 316 km (196 mi). Perigee: 204 km (126 mi). Inclination: 64.90 deg. Period: 89.70 min. High resolution photo reconnaissance satellite; returned film capsule. 1966 November 12 - . 09:50 GMT - . Launch Site: Plesetsk. Launch Complex: Plesetsk LC41/1. LV Family: R-7. Launch Vehicle: Voskhod 11A57. Cosmos 131 - . Mass: 6,300 kg (13,800 lb). Nation: Russia. Agency: MOM. Class: Surveillance. Type: Military surveillance satellite. Spacecraft Bus: Vostok. Spacecraft: Zenit-4. Duration: 8.00 days. Decay Date: 1966-11-20 . USAF Sat Cat: 2568 . COSPAR: 1966-105A. Apogee: 335 km (208 mi). Perigee: 202 km (125 mi). Inclination: 72.80 deg. Period: 89.80 min. High resolution photo reconnaissance satellite; returned film capsule. 1966 December 3 - . 08:09 GMT - . Launch Site: Baikonur. Launch Complex: Baikonur LC31. LV Family: R-7. Launch Vehicle: Voskhod 11A57. Cosmos 134 - . Mass: 6,300 kg (13,800 lb). Nation: Russia. Agency: MOM. Class: Surveillance. Type: Military surveillance satellite. Spacecraft Bus: Vostok. Spacecraft: Zenit-4. Duration: 8.00 days. Decay Date: 1966-12-11 . USAF Sat Cat: 2603 . COSPAR: 1966-108A. Apogee: 286 km (177 mi). Perigee: 206 km (128 mi). Inclination: 64.90 deg. Period: 89.50 min. High resolution photo reconnaissance satellite; returned film capsule; also carried scientific experiments..
1967 February 8 - . 10:19 GMT - . Launch Site: Plesetsk. Launch Complex: Plesetsk LC41/1. LV Family: R-7. Launch Vehicle: Voskhod 11A57. Cosmos 141 - . Mass: 6,300 kg (13,800 lb). Nation: Russia. Agency: MOM. Class: Surveillance. Type: Military surveillance satellite. Spacecraft Bus: Vostok. Spacecraft: Zenit-4. Duration: 8.00 days. Decay Date: 1967-02-16 . USAF Sat Cat: 2670 . COSPAR: 1967-012A. Apogee: 316 km (196 mi). Perigee: 205 km (127 mi). Inclination: 72.90 deg. Period: 89.70 min. High resolution photo reconnaissance satellite; returned film capsule. 1967 March 22 - . 12:44 GMT - . Launch Site: Plesetsk. Launch Complex: Plesetsk LC41/1. LV Family: R-7. Launch Vehicle: Voskhod 11A57. Cosmos 150 - . Mass: 6,300 kg (13,800 lb). Nation: Russia. Agency: MOM. Class: Surveillance. Type: Military surveillance satellite. Spacecraft Bus: Vostok. Spacecraft: Zenit-4. Duration: 8.00 days. Decay Date: 1967-03-30 . USAF Sat Cat: 2715 . COSPAR: 1967-025A. Apogee: 341 km (211 mi). Perigee: 178 km (110 mi). Inclination: 65.40 deg. Period: 89.60 min. High resolution photo reconnaissance satellite; returned film capsule. 1967 April 12 - . 10:51 GMT - . Launch Site: Baikonur. Launch Complex: Baikonur LC1. LV Family: R-7. Launch Vehicle: Voskhod 11A57. Cosmos 155 - . Payload: Zenit-4. Mass: 6,300 kg (13,800 lb). Nation: Russia. Agency: MOM. Class: Surveillance. Type: Military surveillance satellite. Spacecraft Bus: Vostok. Spacecraft: Zenit-4. Duration: 8.00 days. Decay Date: 1967-04-20 . USAF Sat Cat: 2750 . COSPAR: 1967-033A. Apogee: 267 km (165 mi). Perigee: 200 km (120 mi). Inclination: 51.80 deg. Period: 89.20 min. High resolution photo reconnaissance satellite; returned film capsule. 1967 May 22 - . 14:00 GMT - . Launch Site: Plesetsk. Launch Complex: Plesetsk LC41/1. LV Family: R-7. Launch Vehicle: Voskhod 11A57. Cosmos 161 - . Mass: 6,300 kg (13,800 lb). Nation: Russia. Agency: MOM. Class: Surveillance. Type: Military surveillance satellite. Spacecraft Bus: Vostok. Spacecraft: Zenit-4. Duration: 8.00 days. Decay Date: 1967-05-30 . USAF Sat Cat: 2812 . COSPAR: 1967-049A. Apogee: 321 km (199 mi). Perigee: 201 km (124 mi). Inclination: 65.60 deg. Period: 89.70 min. High resolution photo reconnaissance satellite; returned film capsule. 1967 June 1 - . 10:40 GMT - . Launch Site: Baikonur. Launch Complex: Baikonur LC1. LV Family: R-7. Launch Vehicle: Voskhod 11A57. Cosmos 162 - . Mass: 6,300 kg (13,800 lb). Nation: Russia. Agency: MOM. Class: Surveillance. Type: Military surveillance satellite. Spacecraft Bus: Vostok. Spacecraft: Zenit-4. Duration: 8.00 days. Decay Date: 1967-06-09 . USAF Sat Cat: 2827 . COSPAR: 1967-054A. Apogee: 275 km (170 mi). Perigee: 196 km (121 mi). Inclination: 51.80 deg. Period: 89.20 min. High resolution photo reconnaissance satellite; returned film capsule. 1967 June 20 - . Launch Site: Plesetsk. Launch Complex: Plesetsk LC41/1. LV Family: R-7. Launch Vehicle: Voskhod 11A57. FAILURE: Failure. Failed Stage: U. 1967 July 21 - . 06:00 GMT - . Launch Site: Baikonur. Launch Complex: Baikonur LC31. LV Family: R-7. Launch Vehicle: Voskhod 11A57. FAILURE: Failure. Failed Stage: U. 1967 August 9 - . 05:45 GMT - . Launch Site: Baikonur. Launch Complex: Baikonur LC1. Launch Pad: LC1/LC31?. LV Family: R-7. Launch Vehicle: Voskhod 11A57. Cosmos 172 - . Mass: 6,300 kg (13,800 lb). Nation: Russia. Agency: MOM. Class: Surveillance. Type: Military surveillance satellite. Spacecraft Bus: Vostok. Spacecraft: Zenit-4. Duration: 8.00 days. Decay Date: 1967-08-17 . USAF Sat Cat: 2914 . COSPAR: 1967-078A. Apogee: 277 km (172 mi). Perigee: 206 km (128 mi). Inclination: 51.70 deg. Period: 89.30 min. High resolution photo reconnaissance satellite; returned film capsule. 1967 September 11 - . 10:30 GMT - . Launch Site: Plesetsk. LV Family: R-7. Launch Vehicle: Voskhod 11A57. Cosmos 175 - . Mass: 6,300 kg (13,800 lb). Nation: Russia. Agency: MOM. Class: Surveillance. Type: Military surveillance satellite. Spacecraft Bus: Vostok. Spacecraft: Zenit-4. Duration: 8.00 days. Decay Date: 1967-09-19 . USAF Sat Cat: 2939 . COSPAR: 1967-085A. Apogee: 356 km (221 mi). Perigee: 181 km (112 mi). Inclination: 72.80 deg. Period: 89.80 min. High resolution photo reconnaissance satellite; returned film capsule. 1967 October 16 - . 08:00 GMT - . Launch Site: Baikonur. Launch Complex: Baikonur LC1. Launch Pad: LC31. LV Family: R-7. Launch Vehicle: Voskhod 11A57. Cosmos 182 - . Mass: 6,300 kg (13,800 lb). Nation: Russia. Agency: MOM. Class: Surveillance. Type: Military surveillance satellite. Spacecraft Bus: Vostok. Spacecraft: Zenit-4. Duration: 8.00 days. Decay Date: 1967-10-24 . USAF Sat Cat: 2995 . COSPAR: 1967-098A. Apogee: 374 km (232 mi). Perigee: 197 km (122 mi). Inclination: 64.90 deg. Period: 90.20 min. High resolution photo reconnaissance satellite; returned film capsule. 1967 November 3 - . 11:20 GMT - . Launch Site: Plesetsk. LV Family: R-7. Launch Vehicle: Voskhod 11A57. Cosmos 190 - . Mass: 6,300 kg (13,800 lb). Nation: Russia. Agency: MOM. Class: Surveillance. Type: Military surveillance satellite. Spacecraft Bus: Vostok. Spacecraft: Zenit-4. Duration: 8.00 days. Decay Date: 1967-11-11 . USAF Sat Cat: 3026 . COSPAR: 1967-110A. Apogee: 327 km (203 mi). Perigee: 197 km (122 mi). Inclination: 65.60 deg. Period: 89.70 min. High resolution photo reconnaissance satellite; returned film capsule. 1967 December 3 - . 12:00 GMT - . Launch Site: Plesetsk. LV Family: R-7. Launch Vehicle: Voskhod 11A57. Cosmos 194 - . Mass: 6,300 kg (13,800 lb). Nation: Russia. Agency: MOM. Class: Surveillance. Type: Military surveillance satellite. Spacecraft Bus: Vostok. Spacecraft: Zenit-4. Duration: 8.00 days. Decay Date: 1967-12-11 . USAF Sat Cat: 3055 . COSPAR: 1967-119A. Apogee: 312 km (193 mi). Perigee: 201 km (124 mi). Inclination: 65.60 deg. Period: 89.60 min. High resolution photo reconnaissance satellite; returned film capsule. 1968 February 6 - . 08:00 GMT - . Launch Site: Baikonur. Launch Complex: Baikonur LC1. Launch Pad: LC31. LV Family: R-7. Launch Vehicle: Voskhod 11A57. Cosmos 201 - . Mass: 6,300 kg (13,800 lb). Nation: Russia. Agency: MOM. Class: Surveillance. Type: Military surveillance satellite. Spacecraft Bus: Vostok. Spacecraft: Zenit-4. Duration: 8.00 days. Decay Date: 1968-02-14 . USAF Sat Cat: 3118 . COSPAR: 1968-009A. Apogee: 334 km (207 mi). Perigee: 207 km (128 mi). Inclination: 64.90 deg. Period: 89.90 min. High resolution photo reconnaissance satellite; returned film capsule. 1968 March 16 - . 12:30 GMT - . Launch Site: Plesetsk. LV Family: R-7. Launch Vehicle: Voskhod 11A57. Cosmos 207 - . Mass: 6,300 kg (13,800 lb). Nation: Russia. Agency: MOM. Class: Surveillance. Type: Military surveillance satellite. Spacecraft Bus: Vostok. Spacecraft: Zenit-4. Duration: 8.00 days. Decay Date: 1968-03-24 . USAF Sat Cat: 3154 . COSPAR: 1968-021A. Apogee: 320 km (190 mi). Perigee: 201 km (124 mi). Inclination: 65.60 deg. Period: 89.70 min. High resolution photo reconnaissance satellite; returned film capsule. 1968 April 18 - . 10:30 GMT - . Launch Site: Plesetsk. LV Family: R-7. Launch Vehicle: Voskhod 11A57. Cosmos 214 - . Mass: 6,300 kg (13,800 lb). Nation: Russia. Agency: MOM. Class: Surveillance. Type: Military surveillance satellite. Spacecraft Bus: Vostok. Spacecraft: Zenit-4. Duration: 8.00 days. Decay Date: 1968-04-26 . USAF Sat Cat: 3203 . COSPAR: 1968-032A. Apogee: 373 km (231 mi). Perigee: 200 km (120 mi). Inclination: 81.40 deg. Period: 90.30 min. High resolution photo reconnaissance satellite; returned film capsule. 1968 June 4 - . 06:45 GMT - . Launch Site: Baikonur. Launch Complex: Baikonur LC1. Launch Pad: LC31. LV Family: R-7. Launch Vehicle: Voskhod 11A57. Cosmos 224 - . Mass: 6,300 kg (13,800 lb). Nation: Russia. Agency: MOM. Class: Surveillance. Type: Military surveillance satellite. Spacecraft Bus: Vostok. Spacecraft: Zenit-4. Duration: 8.00 days. Decay Date: 1968-06-12 . USAF Sat Cat: 3276 . COSPAR: 1968-046A. Apogee: 256 km (159 mi). Perigee: 203 km (126 mi). Inclination: 51.80 deg. Period: 89.10 min. High resolution photo reconnaissance satellite; returned film capsule; also measured atmospheric composition..
1968 June 18 - . 06:15 GMT - . Launch Site: Baikonur. Launch Complex: Baikonur LC1. Launch Pad: LC31. LV Family: R-7. Launch Vehicle: Voskhod 11A57. Cosmos 227 - . Mass: 6,300 kg (13,800 lb). Nation: Russia. Agency: MOM. Class: Surveillance. Type: Military surveillance satellite. Spacecraft Bus: Vostok. Spacecraft: Zenit-4. Duration: 8.00 days. Decay Date: 1968-06-26 . USAF Sat Cat: 3294 . COSPAR: 1968-051A. Apogee: 271 km (168 mi). Perigee: 202 km (125 mi). Inclination: 51.80 deg. Period: 89.20 min. High resolution photo reconnaissance satellite; returned film capsule. 1968 June 26 - . 11:00 GMT - . Launch Site: Plesetsk. LV Family: R-7. Launch Vehicle: Voskhod 11A57. Cosmos 229 - . Mass: 6,300 kg (13,800 lb). Nation: Russia. Agency: MOM. Class: Surveillance. Type: Military surveillance satellite. Spacecraft Bus: Vostok. Spacecraft: Zenit-4. Duration: 8.00 days. Decay Date: 1968-07-04 . USAF Sat Cat: 3304 . COSPAR: 1968-054A. Apogee: 327 km (203 mi). Perigee: 207 km (128 mi). Inclination: 72.90 deg. Period: 89.90 min. High resolution photo reconnaissance satellite; returned film capsule. 1968 July 16 - . 13:10 GMT - . Launch Site: Plesetsk. LV Family: R-7. Launch Vehicle: Voskhod 11A57. Cosmos 232 - . Mass: 6,300 kg (13,800 lb). Nation: Russia. Agency: MOM. Class: Surveillance. Type: Military surveillance satellite. Spacecraft Bus: Vostok. Spacecraft: Zenit-4. Duration: 8.00 days. Decay Date: 1968-07-24 . USAF Sat Cat: 3322 . COSPAR: 1968-060A. Apogee: 348 km (216 mi). Perigee: 189 km (117 mi). Inclination: 65.30 deg. Period: 89.90 min. High resolution photo reconnaissance satellite; returned film capsule; also performed weather experiments..
1968 July 30 - . 07:00 GMT - . Launch Site: Baikonur. Launch Complex: Baikonur LC1. Launch Pad: LC31. LV Family: R-7. Launch Vehicle: Voskhod 11A57. Cosmos 234 - . Mass: 6,300 kg (13,800 lb). Nation: Russia. Agency: MOM. Class: Surveillance. Type: Military surveillance satellite. Spacecraft Bus: Vostok. Spacecraft: Zenit-4. Duration: 6.00 days. Decay Date: 1968-08-05 . USAF Sat Cat: 3332 . COSPAR: 1968-062A. Apogee: 288 km (178 mi). Perigee: 208 km (129 mi). Inclination: 51.80 deg. Period: 89.40 min. High resolution photo reconnaissance satellite; returned film capsule. 1968 August 27 - . 12:29 GMT - . Launch Site: Plesetsk. LV Family: R-7. Launch Vehicle: Voskhod 11A57. Cosmos 237 - . Mass: 6,300 kg (13,800 lb). Nation: Russia. Agency: MOM. Class: Surveillance. Type: Military surveillance satellite. Spacecraft Bus: Vostok. Spacecraft: Zenit-4. Duration: 8.00 days. Decay Date: 1968-09-04 . USAF Sat Cat: 3348 . COSPAR: 1968-071A. Apogee: 320 km (190 mi). Perigee: 200 km (120 mi). Inclination: 65.40 deg. Period: 89.70 min. High resolution photo reconnaissance satellite; returned film capsule. 1968 September 5 - . 07:00 GMT - . Launch Site: Baikonur. Launch Complex: Baikonur LC1. Launch Pad: LC31. LV Family: R-7. Launch Vehicle: Voskhod 11A57. Cosmos 239 - . Mass: 6,300 kg (13,800 lb). Nation: Russia. Agency: MOM. Class: Surveillance. Type: Military surveillance satellite. Spacecraft Bus: Vostok. Spacecraft: Zenit-4. Duration: 8.00 days. Decay Date: 1968-09-13 . USAF Sat Cat: 3353 . COSPAR: 1968-073A. Apogee: 274 km (170 mi). Perigee: 201 km (124 mi). Inclination: 51.80 deg. Period: 89.20 min. High resolution photo reconnaissance satellite; returned film capsule. 1968 September 16 - . 12:30 GMT - . Launch Site: Plesetsk. LV Family: R-7. Launch Vehicle: Voskhod 11A57. Cosmos 241 - . Mass: 6,300 kg (13,800 lb). Nation: Russia. Agency: MOM. Class: Surveillance. Type: Military surveillance satellite. Spacecraft Bus: Vostok. Spacecraft: Zenit-4. Duration: 8.00 days. Decay Date: 1968-09-24 . USAF Sat Cat: 3398 . COSPAR: 1968-077A. Apogee: 326 km (202 mi). Perigee: 198 km (123 mi). Inclination: 65.40 deg. Period: 89.70 min. High resolution photo reconnaissance satellite; returned film capsule. 1968 October 7 - . 12:05 GMT - . Launch Site: Plesetsk. LV Family: R-7. Launch Vehicle: Voskhod 11A57. Cosmos 246 - . Mass: 6,300 kg (13,800 lb). Nation: Russia. Agency: MOM. Class: Surveillance. Type: Military surveillance satellite. Spacecraft Bus: Vostok. Spacecraft: Zenit-4. Duration: 5.00 days. Decay Date: 1968-10-12 . USAF Sat Cat: 3473 . COSPAR: 1968-087A. Apogee: 321 km (199 mi). Perigee: 149 km (92 mi). Inclination: 65.40 deg. Period: 89.20 min. High resolution photo reconnaissance satellite; returned film capsule. 1968 November 21 - . 12:10 GMT - . Launch Site: Plesetsk. LV Family: R-7. Launch Vehicle: Voskhod 11A57. Cosmos 254 - . Mass: 6,300 kg (13,800 lb). Nation: Russia. Agency: MOM. Class: Surveillance. Type: Military surveillance satellite. Spacecraft Bus: Vostok. Spacecraft: Zenit-4. Duration: 8.00 days. Decay Date: 1968-11-29 . USAF Sat Cat: 3562 . COSPAR: 1968-104A. Apogee: 335 km (208 mi). Perigee: 197 km (122 mi). Inclination: 65.40 deg. Period: 89.90 min. High resolution photo reconnaissance satellite; returned film capsule. 1969 February 26 - . 08:30 GMT - . Launch Site: Baikonur. Launch Complex: Baikonur LC1. Launch Pad: LC31. LV Family: R-7. Launch Vehicle: Voskhod 11A57. Cosmos 267 - . Mass: 6,300 kg (13,800 lb). Nation: Russia. Agency: MOM. Class: Surveillance. Type: Military surveillance satellite. Spacecraft Bus: Vostok. Spacecraft: Zenit-4. Duration: 8.00 days. Decay Date: 1969-03-06 . USAF Sat Cat: 3765 . COSPAR: 1969-017A. Apogee: 331 km (205 mi). Perigee: 202 km (125 mi). Inclination: 70.00 deg. Period: 89.80 min. High resolution photo reconnaissance satellite; returned film capsule. 1969 March 6 - . 12:15 GMT - . Launch Site: Plesetsk. LV Family: R-7. Launch Vehicle: Voskhod 11A57. Cosmos 270 - . Mass: 6,300 kg (13,800 lb). Nation: Russia. Agency: MOM. Class: Surveillance. Type: Military surveillance satellite. Spacecraft Bus: Vostok. Spacecraft: Zenit-4. Duration: 8.00 days. Decay Date: 1969-03-14 . USAF Sat Cat: 3777 . COSPAR: 1969-022A. Apogee: 331 km (205 mi). Perigee: 200 km (120 mi). Inclination: 65.40 deg. Period: 89.80 min. High resolution photo reconnaissance satellite; returned film capsule. 1969 March 24 - . 10:10 GMT - . Launch Site: Baikonur. Launch Complex: Baikonur LC1. Launch Pad: LC31. LV Family: R-7. Launch Vehicle: Voskhod 11A57. Cosmos 274 - . Mass: 6,300 kg (13,800 lb). Nation: Russia. Agency: MOM. Class: Surveillance. Type: Military surveillance satellite. Spacecraft Bus: Vostok. Spacecraft: Zenit-4. Duration: 8.00 days. Decay Date: 1969-04-01 . USAF Sat Cat: 3833 . COSPAR: 1969-028A. Apogee: 300 km (180 mi). Perigee: 206 km (128 mi). Inclination: 65.00 deg. Period: 89.60 min. High resolution photo reconnaissance satellite; returned film capsule; also carried science package..
1969 April 4 - . 10:20 GMT - . Launch Site: Plesetsk. LV Family: R-7. Launch Vehicle: Voskhod 11A57. Cosmos 276 - . Mass: 6,300 kg (13,800 lb). Nation: Russia. Agency: MOM. Class: Surveillance. Type: Military surveillance satellite. Spacecraft Bus: Vostok. Spacecraft: Zenit-4. Duration: 7.00 days. Decay Date: 1969-04-11 . USAF Sat Cat: 3854 . COSPAR: 1969-032A. Apogee: 371 km (230 mi). Perigee: 200 km (120 mi). Inclination: 81.40 deg. Period: 90.30 min. High resolution photo reconnaissance satellite; returned film capsule. 1969 April 15 - . 08:14 GMT - . Launch Site: Baikonur. Launch Complex: Baikonur LC1. Launch Pad: LC1 or LC31. LV Family: R-7. Launch Vehicle: Voskhod 11A57. Cosmos 279 - . Mass: 6,300 kg (13,800 lb). Nation: Russia. Agency: MOM. Class: Surveillance. Type: Military surveillance satellite. Spacecraft Bus: Vostok. Spacecraft: Zenit-4. Duration: 8.00 days. Decay Date: 1969-04-23 . USAF Sat Cat: 3893 . COSPAR: 1969-038A. Apogee: 267 km (165 mi). Perigee: 192 km (119 mi). Inclination: 51.70 deg. Period: 89.00 min. High resolution photo reconnaissance satellite; returned film capsule. 1969 May 20 - . 08:40 GMT - . Launch Site: Plesetsk. LV Family: R-7. Launch Vehicle: Voskhod 11A57. Cosmos 282 - . Mass: 6,300 kg (13,800 lb). Nation: Russia. Agency: MOM. Class: Surveillance. Type: Military surveillance satellite. Spacecraft Bus: Vostok. Spacecraft: Zenit-4. Duration: 8.00 days. Decay Date: 1969-05-28 . USAF Sat Cat: 3944 . COSPAR: 1969-044A. Apogee: 321 km (199 mi). Perigee: 202 km (125 mi). Inclination: 65.40 deg. Period: 89.70 min. High resolution photo reconnaissance satellite; returned film capsule. 1969 May 29 - . 06:59 GMT - . Launch Site: Baikonur. Launch Complex: Baikonur LC1. Launch Pad: LC31. LV Family: R-7. Launch Vehicle: Voskhod 11A57. Cosmos 284 - . Mass: 6,300 kg (13,800 lb). Nation: Russia. Agency: MOM. Class: Surveillance. Type: Military surveillance satellite. Spacecraft Bus: Vostok. Spacecraft: Zenit-4. Duration: 8.00 days. Decay Date: 1969-06-06 . USAF Sat Cat: 3971 . COSPAR: 1969-048A. Apogee: 297 km (184 mi). Perigee: 204 km (126 mi). Inclination: 51.70 deg. Period: 89.50 min. High resolution photo reconnaissance satellite; returned film capsule. 1969 June 15 - . 08:59 GMT - . Launch Site: Plesetsk. LV Family: R-7. Launch Vehicle: Voskhod 11A57. Cosmos 286 - . Mass: 6,300 kg (13,800 lb). Nation: Russia. Agency: MOM. Class: Surveillance. Type: Military surveillance satellite. Spacecraft Bus: Vostok. Spacecraft: Zenit-4. Duration: 8.00 days. Decay Date: 1969-06-23 . USAF Sat Cat: 3988 . COSPAR: 1969-052A. Apogee: 322 km (200 mi). Perigee: 197 km (122 mi). Inclination: 65.40 deg. Period: 89.70 min. High resolution photo reconnaissance satellite; returned film capsule. 1969 June 27 - . 06:59 GMT - . Launch Site: Baikonur. Launch Complex: Baikonur LC1. Launch Pad: LC1 or LC31. LV Family: R-7. Launch Vehicle: Voskhod 11A57. Cosmos 288 - . Mass: 6,300 kg (13,800 lb). Nation: Russia. Agency: MOM. Class: Surveillance. Type: Military surveillance satellite. Spacecraft Bus: Vostok. Spacecraft: Zenit-4. Duration: 8.00 days. Decay Date: 1969-07-05 . USAF Sat Cat: 3994 . COSPAR: 1969-055A. Apogee: 273 km (169 mi). Perigee: 199 km (123 mi). Inclination: 51.80 deg. Period: 89.20 min. High resolution photo reconnaissance satellite; returned film capsule. 1969 July 10 - . 09:00 GMT - . Launch Site: Plesetsk. LV Family: R-7. Launch Vehicle: Voskhod 11A57. Cosmos 289 - . Mass: 6,300 kg (13,800 lb). Nation: Russia. Agency: MOM. Class: Surveillance. Type: Military surveillance satellite. Spacecraft Bus: Vostok. Spacecraft: Zenit-4. Duration: 5.00 days. Decay Date: 1969-07-15 . USAF Sat Cat: 4034 . COSPAR: 1969-057A. Apogee: 324 km (201 mi). Perigee: 194 km (120 mi). Inclination: 65.30 deg. Period: 89.60 min. High resolution photo reconnaissance satellite; returned film capsule. 1969 August 19 - . 13:00 GMT - . Launch Site: Plesetsk. LV Family: R-7. Launch Vehicle: Voskhod 11A57. Cosmos 294 - . Mass: 6,300 kg (13,800 lb). Nation: Russia. Agency: MOM. Class: Surveillance. Type: Military surveillance satellite. Spacecraft Bus: Vostok. Spacecraft: Zenit-4. Duration: 8.00 days. Decay Date: 1969-08-27 . USAF Sat Cat: 4074 . COSPAR: 1969-072A. Apogee: 329 km (204 mi). Perigee: 200 km (120 mi). Inclination: 65.40 deg. Period: 89.80 min. High resolution photo reconnaissance satellite; returned film capsule. 1969 August 29 - . 09:05 GMT - . Launch Site: Baikonur. Launch Complex: Baikonur LC1. Launch Pad: LC31. LV Family: R-7. Launch Vehicle: Voskhod 11A57. Cosmos 296 - . Mass: 6,300 kg (13,800 lb). Nation: Russia. Agency: MOM. Class: Surveillance. Type: Military surveillance satellite. Spacecraft Bus: Vostok. Spacecraft: Zenit-4. Duration: 8.00 days. Decay Date: 1969-09-06 . USAF Sat Cat: 4080 . COSPAR: 1969-075A. Apogee: 302 km (187 mi). Perigee: 207 km (128 mi). Inclination: 65.00 deg. Period: 89.60 min. High resolution photo reconnaissance satellite; returned film capsule. 1969 September 2 - . 11:00 GMT - . Launch Site: Plesetsk. LV Family: R-7. Launch Vehicle: Voskhod 11A57. Cosmos 297 - . Mass: 6,300 kg (13,800 lb). Nation: Russia. Agency: MOM. Class: Surveillance. Type: Military surveillance satellite. Spacecraft Bus: Vostok. Spacecraft: Zenit-4. Duration: 8.00 days. Decay Date: 1969-09-10 . USAF Sat Cat: 4082 . COSPAR: 1969-076A. Apogee: 314 km (195 mi). Perigee: 207 km (128 mi). Inclination: 72.80 deg. Period: 89.70 min. High resolution photo reconnaissance satellite; returned film capsule. 1969 September 18 - . 08:40 GMT - . Launch Site: Baikonur. Launch Complex: Baikonur LC1. Launch Pad: LC31. LV Family: R-7. Launch Vehicle: Voskhod 11A57. Cosmos 299 - . Mass: 6,300 kg (13,800 lb). Nation: Russia. Agency: MOM. Class: Surveillance. Type: Military surveillance satellite. Spacecraft Bus: Vostok. Spacecraft: Zenit-4. Duration: 4.00 days. Decay Date: 1969-09-22 . USAF Sat Cat: 4097 . COSPAR: 1969-078A. Apogee: 284 km (176 mi). Perigee: 207 km (128 mi). Inclination: 65.00 deg. Period: 89.40 min. High resolution photo reconnaissance satellite; returned film capsule. 1969 October 17 - . 11:45 GMT - . Launch Site: Plesetsk. LV Family: R-7. Launch Vehicle: Voskhod 11A57. Cosmos 302 - . Mass: 6,300 kg (13,800 lb). Nation: Russia. Agency: MOM. Class: Surveillance. Type: Military surveillance satellite. Spacecraft Bus: Vostok. Spacecraft: Zenit-4. Duration: 8.00 days. Decay Date: 1969-10-25 . USAF Sat Cat: 4130 . COSPAR: 1969-089A. Apogee: 321 km (199 mi). Perigee: 198 km (123 mi). Inclination: 65.40 deg. Period: 89.70 min. High resolution photo reconnaissance satellite; returned film capsule. 1969 November 15 - . 08:30 GMT - . Launch Site: Baikonur. Launch Complex: Baikonur LC1. Launch Pad: LC31. LV Family: R-7. Launch Vehicle: Voskhod 11A57. Cosmos 310 - . Mass: 6,300 kg (13,800 lb). Nation: Russia. Agency: MOM. Class: Surveillance. Type: Military surveillance satellite. Spacecraft Bus: Vostok. Spacecraft: Zenit-4. Duration: 8.00 days. Decay Date: 1969-11-23 . USAF Sat Cat: 4232 . COSPAR: 1969-100A. Apogee: 336 km (208 mi). Perigee: 204 km (126 mi). Inclination: 65.00 deg. Period: 89.90 min. High resolution photo reconnaissance satellite; returned film capsule. 1970 January 21 - . 12:00 GMT - . Launch Site: Plesetsk. LV Family: R-7. Launch Vehicle: Voskhod 11A57. Cosmos 322 - . Mass: 6,300 kg (13,800 lb). Nation: Russia. Agency: MOM. Class: Surveillance. Type: Military surveillance satellite. Spacecraft Bus: Vostok. Spacecraft: Zenit-4. Duration: 8.00 days. Decay Date: 1970-01-29 . USAF Sat Cat: 4315 . COSPAR: 1970-007A. Apogee: 298 km (185 mi). Perigee: 216 km (134 mi). Inclination: 65.30 deg. Period: 89.60 min. High resolution photo reconnaissance satellite; returned film capsule. 1970 February 10 - . 12:00 GMT - . Launch Site: Plesetsk. LV Family: R-7. Launch Vehicle: Voskhod 11A57. Cosmos 323 - . Mass: 6,300 kg (13,800 lb). Nation: Russia. Agency: MOM. Class: Surveillance. Type: Military surveillance satellite. Spacecraft Bus: Vostok. Spacecraft: Zenit-4. Duration: 8.00 days. Decay Date: 1970-02-18 . USAF Sat Cat: 4328 . COSPAR: 1970-010A. Apogee: 314 km (195 mi). Perigee: 201 km (124 mi). Inclination: 65.40 deg. Period: 89.70 min. High resolution photo reconnaissance satellite; returned film capsule. 1970 April 8 - . 10:15 GMT - . Launch Site: Baikonur. Launch Complex: Baikonur LC1. Launch Pad: LC31. LV Family: R-7. Launch Vehicle: Voskhod 11A57. Cosmos 331 - . Mass: 6,300 kg (13,800 lb). Nation: Russia. Agency: MOM. Class: Surveillance. Type: Military surveillance satellite. Spacecraft Bus: Vostok. Spacecraft: Zenit-4. Duration: 8.00 days. Decay Date: 1970-04-16 . USAF Sat Cat: 4364 . COSPAR: 1970-026A. Apogee: 320 km (190 mi). Perigee: 206 km (128 mi). Inclination: 65.00 deg. Period: 89.80 min. High resolution photo reconnaissance satellite; returned film capsule. 1970 May 20 - . 09:20 GMT - . Launch Site: Baikonur. Launch Complex: Baikonur LC1. Launch Pad: LC31. LV Family: R-7. Launch Vehicle: Voskhod 11A57. Cosmos 345 - . Mass: 6,300 kg (13,800 lb). Nation: Russia. Agency: MOM. Class: Surveillance. Type: Military surveillance satellite. Spacecraft Bus: Vostok. Spacecraft: Zenit-4. Duration: 8.00 days. Decay Date: 1970-05-28 . USAF Sat Cat: 4403 . COSPAR: 1970-039A. Apogee: 296 km (183 mi). Perigee: 153 km (95 mi). Inclination: 52.00 deg. Period: 89.00 min. High resolution photo reconnaissance satellite; returned film capsule. 1970 June 10 - . 09:30 GMT - . Launch Site: Baikonur. Launch Complex: Baikonur LC1. Launch Pad: LC31. LV Family: R-7. Launch Vehicle: Voskhod 11A57. Cosmos 346 - . Mass: 6,300 kg (13,800 lb). Nation: Russia. Agency: MOM. Class: Surveillance. Type: Military surveillance satellite. Spacecraft Bus: Vostok. Spacecraft: Zenit-4. Duration: 7.00 days. Decay Date: 1970-06-17 . USAF Sat Cat: 4409 . COSPAR: 1970-042A. Apogee: 351 km (218 mi). Perigee: 206 km (128 mi). Inclination: 51.80 deg. Period: 90.00 min. High resolution photo reconnaissance satellite; returned film capsule. 1970 June 17 - . 12:59 GMT - . Launch Site: Plesetsk. LV Family: R-7. Launch Vehicle: Voskhod 11A57. Cosmos 349 - . Mass: 6,300 kg (13,800 lb). Nation: Russia. Agency: MOM. Class: Surveillance. Type: Military surveillance satellite. Spacecraft Bus: Vostok. Spacecraft: Zenit-4. Duration: 8.00 days. Decay Date: 1970-06-25 . USAF Sat Cat: 4416 . COSPAR: 1970-045A. Apogee: 332 km (206 mi). Perigee: 199 km (123 mi). Inclination: 65.40 deg. Period: 89.80 min. High resolution photo reconnaissance satellite; returned film capsule. 1970 July 7 - . 10:30 GMT - . Launch Site: Baikonur. Launch Complex: Baikonur LC1. Launch Pad: LC31. LV Family: R-7. Launch Vehicle: Voskhod 11A57. Cosmos 352 - . Mass: 6,300 kg (13,800 lb). Nation: Russia. Agency: MOM. Class: Surveillance. Type: Military surveillance satellite. Spacecraft Bus: Vostok. Spacecraft: Zenit-4. Duration: 8.00 days. Decay Date: 1970-07-15 . USAF Sat Cat: 4446 . COSPAR: 1970-052A. Apogee: 340 km (210 mi). Perigee: 203 km (126 mi). Inclination: 51.80 deg. Period: 89.90 min. High resolution photo reconnaissance satellite; returned film capsule. 1970 July 21 - . Launch Site: Plesetsk. Launch Complex: Plesetsk LC43/4. LV Family: R-7. Launch Vehicle: Voskhod 11A57. FAILURE: Failure. Failed Stage: U. 1970 August 7 - . 09:30 GMT - . Launch Site: Plesetsk. LV Family: R-7. Launch Vehicle: Voskhod 11A57. Cosmos 355 - . Mass: 6,300 kg (13,800 lb). Nation: Russia. Agency: MOM. Class: Surveillance. Type: Military surveillance satellite. Spacecraft Bus: Vostok. Spacecraft: Zenit-4. Duration: 8.00 days. Decay Date: 1970-08-15 . USAF Sat Cat: 4484 . COSPAR: 1970-058A. Apogee: 321 km (199 mi). Perigee: 198 km (123 mi). Inclination: 65.30 deg. Period: 89.60 min. High resolution photo reconnaissance satellite; returned film capsule.